Garlicky Goat Cheese Toast with Arugula | Naturally.Garlicky Goat Cheese Toast with Arugula | Naturally. 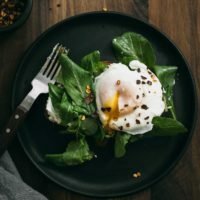 A quick breakfast using soft goat cheese as a base for toast and topped with lemony-arugula and an egg. Ready in about 15 minutes. Heat a small skillet over low heat. Add the olive oil, followed by the minced garlic, Fry until golden and fragrant; about 2 minutes. Transfer to a bowl with the goat cheese and 1/8 teaspoon salt. Mash/stir the garlic into the goat cheese. In a small bowl, combine the remaining salt with the arugula and enough lemon juice to coat the arugula. Toss until combined. Assemble the toast. Spread the goat cheese then layer on the arugula and poached/fried egg. Top with crushed red pepper or black pepper if desired. Tips + Tricks: Whenever I’m at the market, I like to taste the arugula. Different varieties have more of a bite to them. For this I used a more mild arugula but it would work really well with the peppery varieties. If you are sensitive to salt, start with less and add more as desired.